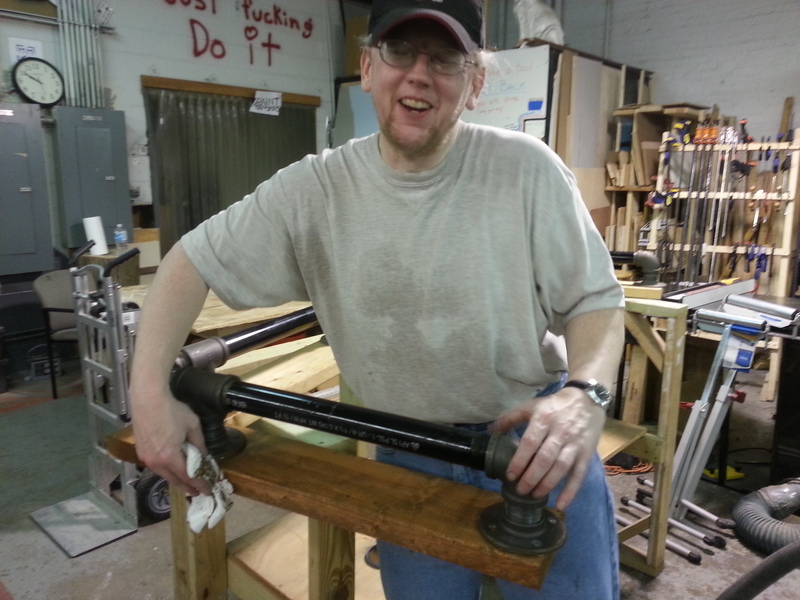 It all began with a dream: a cerebral lubrication station worthy of our fine hackerspace, serving as focal point to transform the lounge from a seldom used area into PS:One’s central communal nexus. From there, a collaborative project was born. PS:One member Greg Daneau built the first incarnation of our bar. 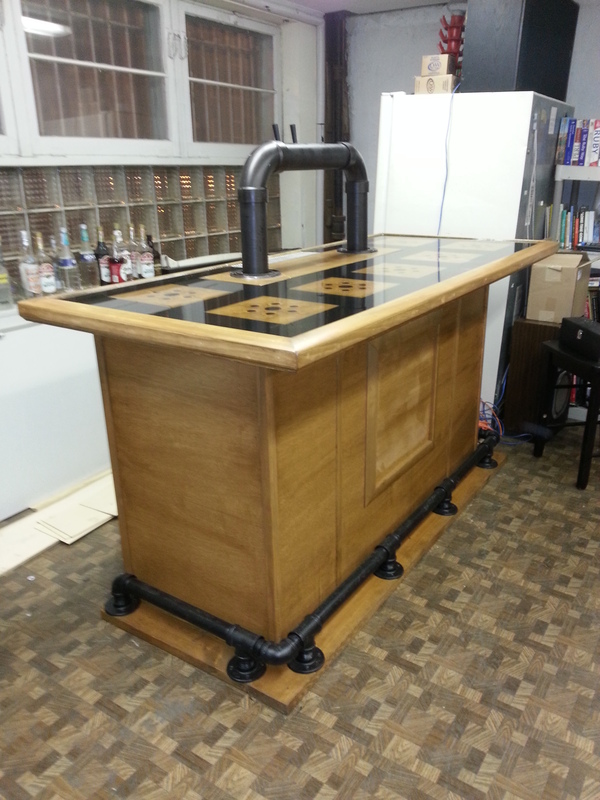 He built the bar top from an unfinished door, an open frame supported it, and it had a foot rail made of pipe. The result was impressive, even if it was but a small shadow of the glory that the bar ultimately became. Thus began an asynchronous collaborative project, with hacker inspiring hacker to hack the bar to higher pinnacles of zymurgical greatness. And it arguably served as an “altar” for the budding Beer Church. 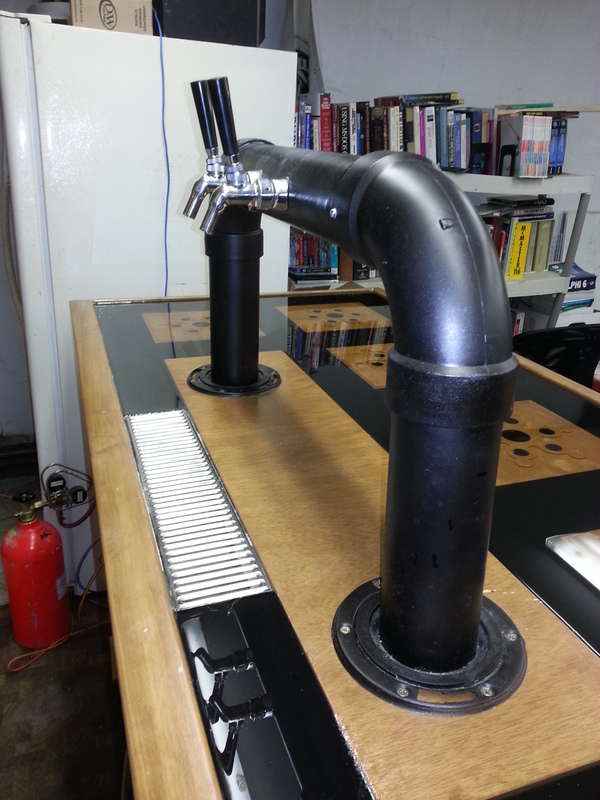 Seeing the bar in all its inebriating glory inspired member Ryan Pierce to build a draft system and kegerator from a donated refrigerator. 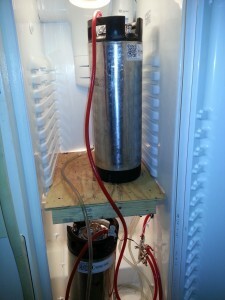 It can hold up to six 5-gallon Cornelius kegs (used frequently by homebrewers) or a single 15.5-gallon beer keg. A fan forces cold air through an insulated hose carrying the beverage lines to the draft tower. The draft tower itself was built from PVC pipe, fittings, and drain flanges. 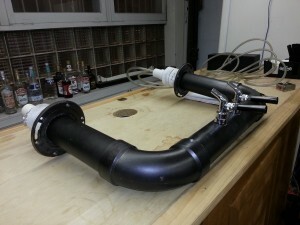 An insulated return hose carries the air back to the refrigerator. This air loop keeps the beverage lines and taps cold, which reduces the tendency of beer to foam in the line. Jeremy used our TIG welder to weld a drain pipe to a stainless steel drip tray, directing any spills into a bucket. The existence of the bar and draft system steered the focus of Beer Church towards kegging. 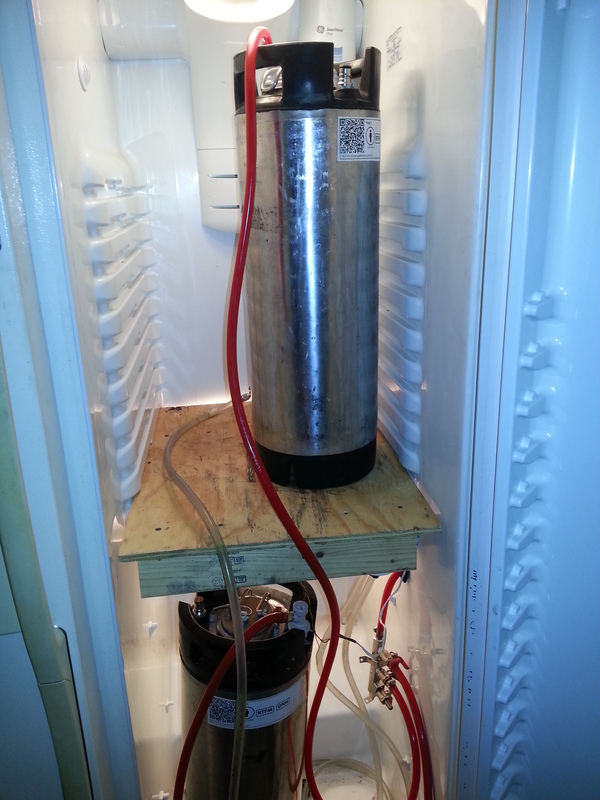 Cornelius kegs can hold finished beer and can be used for natural carbonation (caused by additional secondary fermentation from priming sugar) or forced carbonation supplied directly from a CO2 tank. Then Greg was hit with inspiration again. 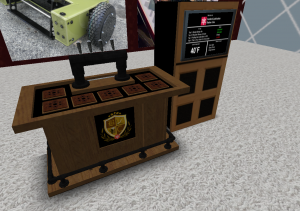 After consulting with several Beer Church members on possible designs, he created several virtual 3D models to visualize the different design alternatives. The winner: a black bar top, with laser cut wood PS:One logos, all covered in clear bar epoxy. 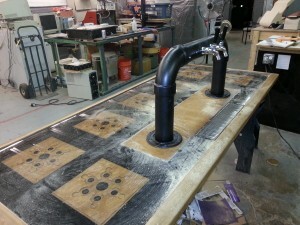 The drip tray will be embedded in the epoxy, and a wood island in the middle of the bar will hold the draft tower. This results in the logos appearing to float in a black vacuum, which we figured would look nothing short of amazing. The front of the bar would proudly display the Beer Church coat of arms. Then Greg began construction. 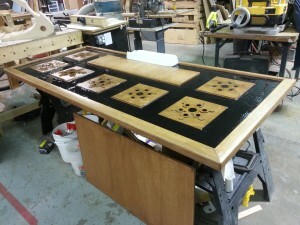 Pictured below is the bar after an initial pour of epoxy. Here, we have the bar top, with all the epoxy poured and cured. 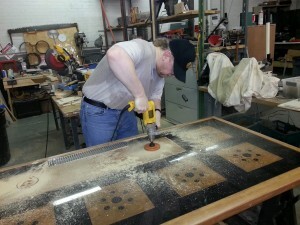 Greg spent 12 hours overnight pouring four layers of epoxy and removing bubbles with a heat gun. Here, Greg is staining the bar rail. Ryan had to disassemble the draft system so it could be moved to the new bar top. Then Greg drilled out holes in the bar top to hold the draft system. This was an application of “measure ten times, cut once.” We were both more than a little bit nervous that everything would fit together again. Shown below, the draft tower is attached to the bar top. Having a draft system in the wood shop located that close to the table saw might give people the wrong idea about tool safety…. 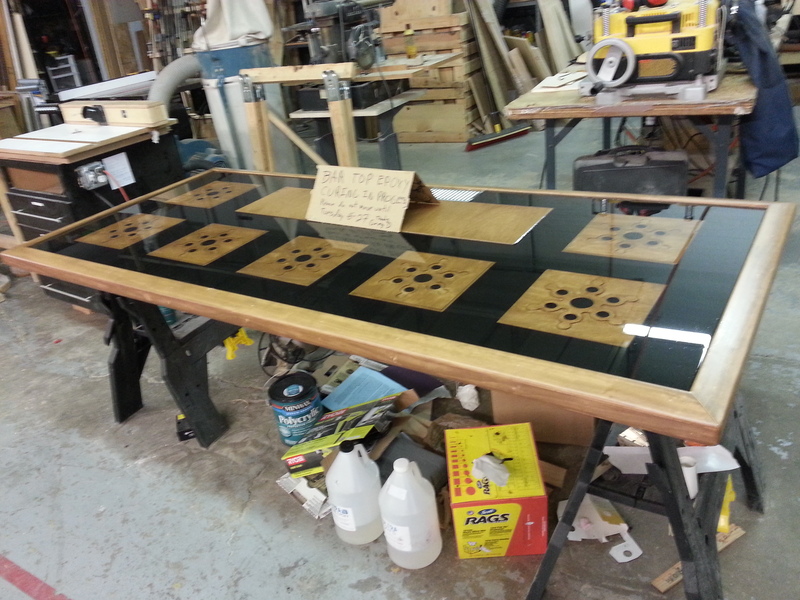 And here is the finished bar top. This almost certainly will not be the end of the story. A bar this awesome can only inspire further greatness. A great way to recycle unfinished products. It even turned out better which makes one think that it was meant to be a bar not a door. LOL.